Do you ever wonder what to grow in the southern fall garden? Some people think that fall is the time to clean up the garden before winter begins. However, there are many things that will grow well in the fall. If you live in the south, you have even more options for a fall garden. Many people find gardening in the fall to be very satisfying. With cooler temperatures and fewer insects, the home gardener can spend more time enjoying the garden and less time maintaining it. In the south, gardening can be similar to spring gardening. Plants that thrive in cooler temperatures are the best choice for the fall garden. Your fall garden planting schedule can include vegetables as well as flowers. Trees bursting with fall colors are enhanced by beautiful blooms and unique foliage of fall shrubs and perennials. Your dinner table can also be bursting with the fresh harvest of fall vegetables. What could be more satisfying? As with any other type of gardening, it is important to know what to grow in the southern fall garden. Growing the right plants will assure your success and make you more likely to continue fall gardening year after year. Azalea-This shrub prefers cool, partially shaded spots in your yard. Some varieties will bloom in the spring and then re-bloom in the fall. Hydrangea-A gorgeous fall show is sure to draw attention from passers-by when you have fall blooming hydrangeas in shades of white, pink and blue. Caryopteris-This beautiful shrub is great as a hedge or for cut flowers from mid-summer through fall, and also a great selection for your fall butterfly garden. Virginia Sweetspire-An incredible show almost year-round, you will love springs white blooms as well as the burgundy blaze of its fall foliage. Asters-Plant this flower in full sun and enjoy a variety of colors from late summer well into fall. 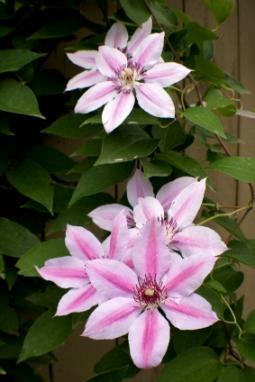 Clematis-Another flower that offers a wide range of color from late summer into mid-fall. You'll have a hard time choosing just one with colors ranging from white to blue to red. Echinacea-Known for its medicinal qualities, Echinacea also provides beautiful color in the southern fall garden. You aren't just limited to the well known purple variety; shades of white, pink and orange will light up your landscape as well as gracing your home with lovely fresh cut flowers. Tomatoes-You don't have to go back to the cardboard, grocery store tomatoes just yet. Plant young tomato plants now and you can continue enjoying them in your salads until the first frost. Herbs-Fall is a wonderful time to plant an herb garden. Plant it close to your kitchen and enjoy the fresh flavor that they provide for months to come. Best choices include basil, parsley and cilantro. Salad greens-Leaf lettuce, spinach and chard love cooler temperatures. You likely enjoyed fresh from the garden salads this past spring. Now that fall is near you can enjoy them again! Cole crops-Vegetables like broccoli and kale also thrive in cooler temperatures. Bugs are less likely to invade at this time of year, leaving more for you to enjoy. Squash-Summer squash can still be harvested in the fall as well as varieties that can be stored through the winter such as acorn squash. Depending on where in the south you live, you won't need much to get you through until the time comes to begin again in the spring. Now that you know what to grow in the southern fall garden, it is easy to see that you can enjoy a tremendous variety of wonderful things nearly year round. If you are lucky enough to live in the south, take advantage of what nature has to offer with fall gardening.